Some cross into the uncanny valley, or at least from iconic to specific. 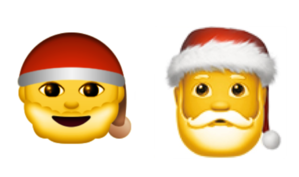 It’s your December festival holiday in August with the release of new emoji and new emoji drawing styles in the public betas of iOS 10 and macOS Sierra. Apple went so far as to issue a press release to note what’s included in the new release, emphasizing the inclusion of female athletes and professionals, a rainbow flag, and more combinations of family structures. Apple is also moving ahead of standardization: the emoji in this public beta include some slated for later adoption and others that Apple is championing. Without eventual Unicode Consortium support, emoji from the Apple ecosystem to other people will display as unknown characters or other symbols on other platforms. Emoji can be used for a lot purposes, be it emotional shorthand, storytelling, emphasis, or as simple symbols. In this update, flags, signage-style icons (as for recycling), and food, drink, animals, places, and sports (for those not including people’s faces or bodies) almost all remain the same. Apple focused on human faces and full figures and changed the lighting and detail on emoticon-style yellow-circle reactions and cat-expression faces—and a few outliers. While Apple is emphasizing inclusiveness, the change in drawing style has a fair amount of significance, too, by shifting the approach from almost cartoonish to a more realistic animation style reminiscent of 3D animated films. Of course, emoji are often used in such small sizes that examining the details may seem overblown. But I think the devil is in the details: we often perceive more deeply than we realize, and experience an emotional reaction that we then can’t articulate. Emoji are set by the Unicode Consortium, a non-profit that determines the representation of all sorts of characters across every language and discipline. Emoji are a sub-class that receives enormous attention because of how popular emoji are for texting. But the Unicode Consortium doesn’t set the appearance of each emoji. Rather, it creates a simple representation in black and white, and designers for each operating system or website (like Facebook) create their own renditions. Sometimes these can be very far apart. If you want to see the full panoply, the consortium has a page with the graphic for each emoji set’s representation. In this update, Apple has brought a few of their outlying emoji back into the fold. Emoji were originally created in the late 1990s in Japan, and the consortium absorbed the task of mapping them into its universal text encoding system in 2010. Since then, it’s expanded the set substantially, mostly over the last two years. There’s no timeline or mandate to include new emoji in system updates, but Apple and others usually lag only by a few months due to demand. Who can wait when they know taco, burrito, and hot dog emoji are coming? Adding skin tones brought some degree of more personal presentation to emojis. The new public betas now include 10 additional families: every combination of single mom and single dad with one and two children across gender binaries. I’m not sure what families with more than two children use for emoji, but there you go—these are both symbolic and concrete at once. Technically, these new families involve coding of combinations of emoji using Zero Width Joiners (ZWJs), which Jason explains in detail in his column. When you open an iOS Pages document containing the new families using El Capitan, those combos are revealed, such as a woman, a boy, and a girl instead of the all-in-one single mom plus one boy and girl emoji. The family gets more options. Apple has also added gender variants for all sports and professions in which a male or ostensibly non-gendered figure was provided before. There’s now a basketball player with cropped hair and one with a ponytail and the slighest suggestion of breasts. For swimmers, the male and female differ between a partial unclothed male torso and a swimsuit on the female version. An exception appears for skiers and snowboarders, who are so covered up they lack gender and skin tone options. Turban wearers and guards—shown with a tall Beefeater-style hat—now have gendered variants, too. And Apple has also added a rainbow flag, which is mapped to the previously available framed rainbow on other platforms. Apple’s strong statements from its CEO Tim Cook and as a company in favor of LBGTQ rights is figuratively being run up a flagpole with this new emoji. As part of this update, Apple has also redrawn most faces and figures, among other changes. For the quasi-figurative smiley-style emoji, the changes are very slight. In most cases, you need to zoom way in to see them, although the subtle effects remain noticeable on a Retina or 4K display. Smileys now have a slightly different light source, with a more intense “hottest” point at the top, some lines are thinner, and the 3D effect is slightly more pronounced. Changes in smileys are noticeable, but not prominent. Seriously, all of these creep me out. Grimace or grin (top)? The new grin (bottom) makes it much clearer. 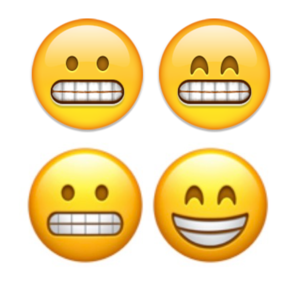 Those long aggravated by Apple’s decision to have the same odd smile appear in both “grinning face with smiling eyes” and “grimacing face,” a problem almost exclusive to Apple’s emoji drawings, will be delighted to know that these are now quite distinct. I don’t know that friendships fell apart when an Android user sent a “grinning face” that an Apple user thought was grimacing, but it was certainly confusing. The face and body style difference is much more pronounced. Faces prior to the iOS 10 and Sierra redrawing were typically circles or wide ovals featuring a comically wide mouth, overlarge eyes with no whites around the irises, and flattened hair, often looking like a Lego mini-fig snap-on piece. The new ones have more realistic head shapes, facial feature proportion, and hair styles. Instead of looking straight on at us, the new drawings appear to be looking slightly up and to the left; we’re not meeting their eyes, but looking at them. Heads and facial features are more accurately proportioned and seem to be more specific as to what they feel (old on top, new at bottom). Part of the facial change also includes giving all the avatars little button noses, which seem more pert and tiny since they’re now in proportion. I don’t suggest that emoji include nose variations alongside skin ones, but there’s a line that gets crossed as the depictions seem more specific. A skin tone might help me represent myself, but what about a nose, lips, and eye shape when a single model is used for every color? The body types has gone from cartoony amorphous to a more well-proportioned thin, which can provoke a whole separate issue of representation. The new drawing style brings in much more realism, even though it’s still a cartoon. But it leaps the difference between something more abstracted and with less facial expression to the flattened style of stereoscopic 3D, familiar in many modern animated films. It reminds me most closely of the new Charlie Brown film, which I saw in 3D, which managed to combine the sensibility of a 2D cartoon drawing with a hint of rounding and depth. Most of the expressions on the newer faces are more muted than the previous emoji generation. The illustrations of younger people have broader smiles than those of older ones. Most of the faces of adults, professions, and activities that have a visible face look seem modestly happy, like having just received a justified compliment and they’re glowing but not pumping their fist. The “older man” emoji is an exception. He seems worried. What is he worried about? What can he see over our shoulder we can’t?! Santa Claus also now seems positively concerned about his delivery schedule, and not so jolly as before. I examined all the emoji carefully, and there’s a kind of hilarious randomness to what redrawn among existing pictures in this update. The gun, defined as a pistol in the Unicode schema, has been replaced with a water pistol with the orange tip required under federal law for toys and imitation firearms. This appears to be the result of a suggestion by Never Mrgan, a Mac and iOS gamemaker at Space Age, but given the timing, it’s possible Apple planned this far in advance. Apple changing the “gun” emoji is extremely dangerous. I playfully send a water gun, and someone else sees a loaded pistol pointed at them? Other changes seem less fraught with politics and repercussions. The “hair-flip woman,” which has always been in actuality “information desk person” (despite being depicted as a woman) now is clearly not flipping her hair up. This again could engender confusion in intent. (“Are they telling me I’m clueless?”) And the happy person raising one hand now has her elbow somewhat akimbo, seeming more hesitant. Someone at Apple also has an interest in tweaking some fine points. The person taking a bath has been updated with a fancier tub, but the drawing for a bath by itself is now full of suds. The heart-eyes on a smiley and a cat face, instead of being recessed like eye shapes, now stand out as if they’re overlaid on the face. The skull and skull-and-bones emoji are now more helmet-shaped, with a bigger cranium relative to the bottom part of the head. And the pouting cat no longer looks sideways—it’s looking right at you! If it seems like too much attention to focus on emoji, it’s not: billions upon billions of them are used every day with often little consideration to the variation across system. The emojitracker site shows their use in real-time on Twitter, along with a counter. The “face with tears of joy” has been used nearly 1.4 billion times on Twitter alone. Emoji summon a feeling and intent, and changes in drawing style, expression, and appearance (as with the gun) will change how they’re used, even if people only notice the changes subliminally. Every emoji set is a different dialect, but the universal translator of Unicode means we don’t hear the original inflection. Apple’s drawing changes and new emoji put a new tone in our fingers, and we’ll have to get use to speaking it—and maybe being a little misunderstood until everyone is synced up again.